This section is written by Erin Archuleta, half of the talent behind local outfit ICHI Catering and ICHI Lucky Cat Deli (coming soon to 331 Cortland in Bernal Heights). For updates, follow @ICHISUSHI on Twitter. Outside of the foodie world, Erin works full-time championing kid literacy at 826 National. Keep up with her @erinarchuleta. Reopening within the next month or so at 155 Columbus is a historic gem of a San Francisco building in an area that’s seen it all: secret societies, prostitution, boxing, and piano-playing. What could be a better place to saddle up for a killer history lesson as you try to drown your database-driven working day blues? The Comstock Saloon is opening up in the site of the former San Francisco Brewing Company, and will offer a full bar and pub fare. Named after Henry Comstock and the Comstock Lode, which brought silvery mining fortunes to the Northwest, the building harkens back to its original Edwardian-era roots established during the Barbary Coast days. Bartender friends Jeff Hollinger and Jonny Raglin ofAbsinthe are taking on this friends-and-family construction project in the much-mythologized border of the Chinatown and North Beach neighborhoods. The 1907 site (rebuilt after the 1906 Great Earthquake and Fire) will reopen with a style that’s not as modern and masculine as it was under the old San Francisco Brewing Company reign. Both guys had dreams of finding a historic San Francisco building, and after searching for a few years, landed on the corner of Pacific and Columbus Avenues. With due respect for the building’s historic status, important upgrades were still called for. For instance, in a cozy move to adhere to ADA bathroom/upgrade compliance, and keep with the original intent of the space, the guys constructed an alcove with a true Victorian/Edwardian parlor in which guests may “have a sit” next to the (faux) wood-burning stove (it runs on energy-efficient gas). Jonny’s work as general contractor on this project has lent incredibly personal touches. His serious interest in the area’s history led him to befriend some local gents from the secretive Ancient and Honorable Order of E Clampus Vitus (best known as the descendents of miners who partake in an annual retreat to the grave of Emperor Norton); they were more than happy to open up about the history of the area. Jeff and Jonny are planning to work with the fraternal order to resurrect the plaque declaring the Comstock Saloon (by the Order) as the last standing bar on the Barbary Coast (it was removed when the SF Brewing Company’s fate was still up in the air). The lead on construction has been Marin-based builder and friend, Steve Bernardini. Steve worked with the team over at Absinthe quite a bit, and the guys really liked his style. Another friend, Anand Gowda, SF-based furniture designer of Gravy Service, is building out the booths and tackling the other woodwork. Jeff and Jonny were familiar with Anand’s work after he built a stunning dining room table for Jonny’s home. You may have spied Anand’s work at the Curiosity Shoppe in the Mission where he designed the shelves. Anand is also working with a classic sepia and evergreen embossed imprint leather for the booth seats, keeping an authentic look for the space. Another friend (and future bartending employee) lending a hand is Matt Conway (of Citizen Cake andNOPA), who was sanding away on dining tables during my visit. These guys have such a cool dynamic while working, they’ve even taped a found (modern) copy of the Declaration of Independence to the bar to keep them rooted in history while they scrape, sand, and hammer. The lighting in the space and all the metal work will be in cool silvers, standing out against the warm wood. The guys said they were purposely steering away from some of the clichés predicted for the space—no brassy finishes. No harkening in a literal way to the mines; instead, evoking the miner’s quest with subtle silver finishes and hints of shine. 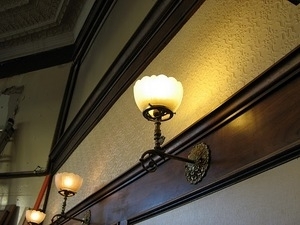 The guys are softening the glow in the saloon with recessed lighting, decorative chandeliers, and sconces sporting Victorian-style fluted shades. On the main dining floor, the five booths will each have their own lighting, casting an intimate glow over brews, cocktails, or a bite. The antique front bar that they’ve been sanding for the last couple of weeks will seat 12 on foundry-cast bar stools with old ball and claw bases, and they’ll also have a big dining table with a marble top to seat larger parties. Jeff and Jonny are leaving the silver-toned beer tower from the brewery in place, and are trying to keep as many nods to the former hotel’s history as possible. One note making this amateur boxing pupil super-excited is the gesture to the Andromeda Café’s original owners, who according to Jonny were big-time boxing promoters who employed Jack Dempsey to work here. Even Baby Face Nelson found his way through the doors in this time, meeting up with bartender Freddie Field and proprietor James J. Griffin, who allegedly introduced him to locals “living left of the law.” In proper fashion, the front area along the long wall will be lined with images of the boxing heroes who frequented the old Andromeda. In more practical, modern-day terms, a huge unexpected benefit coming with the building is the massive amount of space in the lower level. Almost unheard of in the San Francisco dining scene, there are walk-in coolers and there prep space galore. These multiple cold-storage spaces were leftover from the old brewery work, and now these rooms offer up excellent locations for a temperature-regulated preparation kitchen to supply the fare upstairs. Usually in a build-out, plumbing and cold storage can eat up a huge portion of a budget. For these guys, they’ve inherited their own mother lode. In clearing out the catacombs downstairs connecting to the North Beach Hotel, they found panels from the 100-plus-year-old bar, which they are reinstalling. A huge portion of the build-out labor came from removing the old brewing equipment. While gutting the five-plus ton slabs of concrete from the front bar, the guys decided to keep a boisterous piece of furniture—the old upright player piano—and moved it to the mezzanine level, where they’ll employ a regular Ragtime pianist to play during happy hours. The art will remain simple, all except for the Emperor Norton statue above the back bar, which came as an inspired idea to Jonny after listening to a podcast about the peacock-feathered and epaulet-laden Emperor on local San Francisco history blog, Sparkletack. These guys take their San Francisco history seriously, especially when it involves our wacky checkered past. So of course, rather than just recreate a statue, they called on local artist Daniel Macchiarini, whose father, Peter, cast the original mold in 1936. Peter was a beloved bohemian figure, and there’s even a set of North Beach steps named after him. Leaving the Comstock felt a bit like one of those transformative visits you get when you’ve been to a more sacred and hallowed space (albeit this one is probably for our hedonists). The guys note that there was an assumption that San Francisco was this real city when the Gold Rush hopefuls came rambling in, when in fact most of our 7x7 was dotted with nothing more than makeshift camps. It looks as if the Comstock Saloon will be able to invoke a bit of that frivolity and debauchery by way of classic cocktails and offer a meet-up for all the company you keep.